Where students now slouch in their seats, fans once sat on edge, moments away from witnessing a historic sports event on Oct. 13, 1960 — now dubbed Mazeroski Day. In game seven of the 1960 World Series, Pirate Bill Mazeroski came to the plate at the bottom of the ninth with the game tied at nine. On a 1-0 pitch, he crushed a walk-off homerun to propel the Pirates to their third Series title. This was — and still is — the only walk-off homerun in game seven in World Series history. Beyond hosting this significant moment, Forbes Field played an important part in Pittsburgh sports history, operating from 1909 until 1970. The Pirates, the Steelers and even the Panther football team played on the field. Forbes Field revolutionized stadiums. It was the first stadium made completely of concrete and steel and included elements such as ramps, elevators and box seats — all amenities that didn’t exist in other stadiums at the time. The Pirates’ owner, Barney Dreyfuss, chose Oakland to house the stadium for its growing popularity. He also attracted fans with reasonable ticket prices and memorabilia giveaways, concepts new to Major League Baseball. John Garvutt, a resident of Monongahela in the 1950s, remembers Forbes Field as a place with opportunities for everyone to enjoy a game. Armed with a talented team that won the National League Pennant in 1901, 1902 and 1903, Dreyfuss had the perfect, revolutionary venue to showcase his players. He also helped create the World Series in 1903 — the new championship between the National and American Leagues — to further display his National League talent. The main catalyst behind the Pirates’ success in the early 1900s was Hall of Fame shortstop Honus Wagner — one of the greatest baseball players ever. During the first decade of the 20th century, Wagner led the Major Leagues in batting average, hits and runs batted in. When Forbes Field opened in 1909, Wagner and the Pirates trounced the Tigers 8-0 in game seven of the World Series to capture the first World Series in Pirates history. The Pirates won another World Series in seven games in 1925, defeating the Washington Senators for their second World Series title. This time, Wagner didn’t play on the team, but Hall of Famers Pie Traynor and Max Carey led the team, driving in three runs in a tight 9-7 game seven victory. This talented Pirates team made it back to the World Series in 1927, just two years later. The Bucs were swept by the Yankees and their “Murderer’s Row” lineup, including all-time greats such as Babe Ruth and Lou Gehrig to round out a lineup with four Hall of Fame hitters. Not only did the Pirates occupy the space, but the Panther football team also played at Forbes Field from 1909 to 1924 until their own stadium, Pitt Stadium, was built in Oakland in 1925. During this time, the Panthers were a dominant team and won a total of five national championships. In their first season at the stadium in 1910, the Panthers did not give up a single point en route to an undefeated season. Aside from baseball and football, prominent boxing matches took place at Forbes Field. One of the biggest matches was the 1951 Heavyweight Boxing Championship, in which Jersey Joe Walcott beat Ezzard Charles in seven rounds to win the title. As baseball grew more popular in America, Forbes Field structurally adapted to fit the times. A grandstand was added in 1925, a new press box was created and lights were added for night games. Even though the Pirates didn’t go on to win another World Series until 1960, the Pirates had talented players, such as Ralph Kiner and Bill Mazeroski. And announcers such as Rosie Rowswell made the games even more enjoyable for fans. In 1960, the Pirates found themselves back in the World Series for the first time since their 1927 loss to the Yankees. This time, they beat the Yankees in dramatic fashion at Forbes Field thanks to Mazeroski’s game seven homerun in the bottom of the ninth. As the Pirates reached the height of success, Forbes Field began showing signs of deterioration. 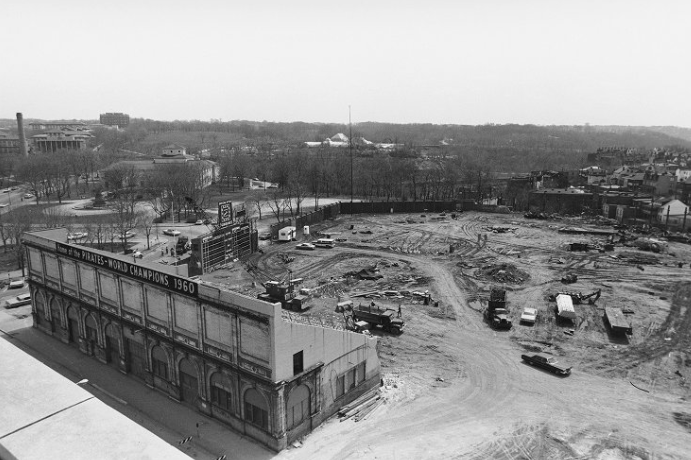 In response, the Pirates started to construct a new field, Three Rivers Stadium, in downtown Pittsburgh. They played their final game at Forbes Field in 1970. For Pitt students today, taking a bus to see any type of baseball or football game is commonplace. But having access to Pittsburgh sports right on campus is still something Pitt students think about. “I want to go to more [Pirates] games as it is, and if it was closer, I’d definitely go,” sophomore information sciences major Will Fleischer said. Yet, because Pitt has grown and Oakland has developed, stadiums may not physically fit in Oakland or match the college-town environment in the area. No matter where the stadiums sit today, Oakland and Forbes Field have played a large part in Pittsburgh’s sports history. “All of those greats that were in the Hall of Fame, I probably saw all of them,” Garvutt said. Contributed reporting by Dominic Campbell. Editor’s note: This story has been corrected after we reported several incorrect years regarding the Pirates’ history. The Pitt News regrets this error.